Three staterooms in a 35’ Motor Yacht … a very innovative layout! The larger than average hardtop aft deck area is complimented by a beautiful built-in wet bar with bar dispensing system, ice maker, storage and removable custom table. Three molded-in steps take you to the flybridge where there is ample seating for more guests. Owners and guests can socialize and prepare meals together inside the bright and airy cabin where the salon, galley and dinette are all on one level. No need to start the 7kw generator to prepare meals with the propane stove and oven – an excellent option to have while anchoring out! The V-berth cabin is large, bright and airy with storage and a privacy door. You can leave the mid stateroom open to the V-berth or close it off as a third private cabin. The master stateroom aft cabin is surprisingly roomy and includes an island berth, head, vanity and separate shower rooms. Relatively wide side decks and molded steps to the swim platform make moving about on deck a safe and easy experience. 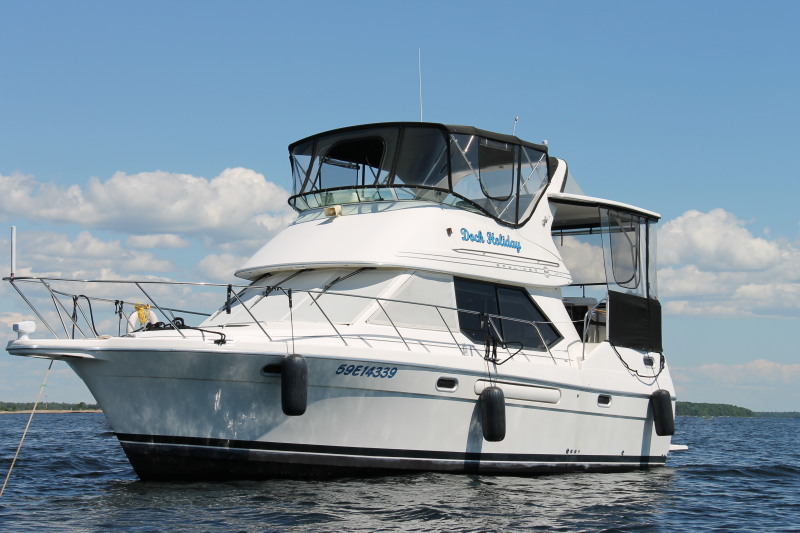 This Bayliner 3587 is extremely well optioned and is a pleasure to show!